Most nights (possibly all) the same middle-aged man works in the kitchen, poaching and slicing chicken behind an aluminum structure with a roof and a glass display case full of artificial chickens. This structure has a sign in Thai lettering, and looks like a street vendor’s stall, but it is indoors, separating a dining area with two tables from a tiny kitchen. 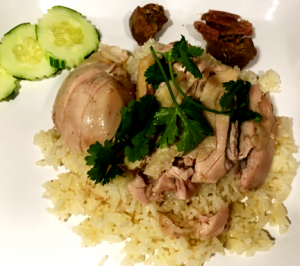 The restaurant, Eim Khao Mun Kai, makes only one dish—Hainan chicken rice—and they make it well. Hainan chicken rice, in spite of the name, is mainly known as a Singaporean dish, although it is popular throughout Southeast Asia, from Thailand to Hong Kong. The story is that immigrants from Hainan introduced it to Singapore. 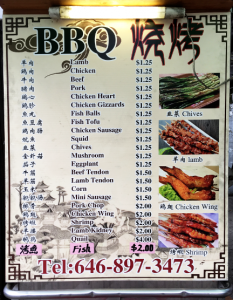 Supposedly in Hainan they use old chickens and in Singapore they use young chickens, but more importantly, the preparation is different. The Hainanese innovation was to cook rice in water that had already been used to prepare chicken. You start by boiling chicken in water until it is cooked. Then you begin cooking rice in chicken fat, and add the stock you cooked the chicken in. My recipe for classical Hainan chicken rice leaves it at that; if more flavor is desired, you add a dipping sauce. However, I believe that in Singapore and much of Southeast Asia, ginger and other aromatic substances are added to the rice during cooking. This, in any case, is what they do at Eim Khao Mun Kai, where the rice has a wonderful aroma and flavor, succulent from the chicken stock but light and refreshing from the ginger. Here the centerpiece of the dish is a giant globe of the rice, over which are laid long strips of tender chicken. Offal (heart, liver, and a few other organs) sits in a pile at the side. The chicken meat itself is not good, if not by itself very flavorful. The rice is wonderful, and I can imagine eating a plate of it without any additional ingredients. You are also given a couple of sauces meant to be stirred in, however. These sauces—containing more ginger, chilies, and I believe soy sauce—transform both the chicken and the rice. The dish becomes recognizably Thai, with complex and deep flavors that will stay with you well after eating the meal. Because they are powerful, I recommend sampling the rice before adding the sauces. Stout and sometimes stately apartment buildings surround much of 108th Street in Forest Hills. Their brick, oddly institutional facades stand behind broad lawns with trees and manicured hedges, evoking psychiatric hospitals for the wealthy. It is a strange neighborhood, and strolling through it, I half expected to find H.G. Wells’s door in a wall to a magic garden. Instead I found Bukharian Broadway. Bukharian Broadway is a short commercial strip, not directly connected to the Bukharian strip further west on 63rd Road, and seemingly not connected to anything in particular, but hovering magically in the midst of blocks of Victorian behemoths. It is, however, connected to the neighborhood by the young boys in yalmukes who run shouting in Russian from the leafy streets down past the storefronts, and the women with bouffants who yell after them. 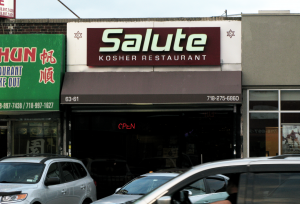 Salute is one of the most widely respected Bukharian restaurants here. It is run by a Bukharian family from Tajikistan and, like Cheburechnaya, it closes for Shabbat. The interior of Salute is, like the neighborhood outside, a little strange. The walls are covered in pink-marble wall paper, and mirrors with white frames and lamps affixed to them hang from the walls at regular intervals. The ceiling has Victorian style molding, and two chandeliers hang from lozenge-shaped recesses in the ceiling. Track lighting runs around the interior of the recesses, and it slowly shifts color—from red, to blue, to green, to white. The decorator seems to have combined kitschy rococo with nightclub ambience. Although the food here is highly regarded, there have been some doubts about the service. There is serious online debate about whether the service at Salute and some other Bukharian restaurants is rude, racist, or simply Russian. It is true that Russians are known for their public reserve, and it’s possible that other Central Asians share this characteristic—especially Bukharians, the majority of whom speak Russian and share a Soviet heritage with Russians. Whatever the case may be, my waitress was attentive, courteous, and perhaps even warm, while certainly reserved. I started with Uzbek mantu. 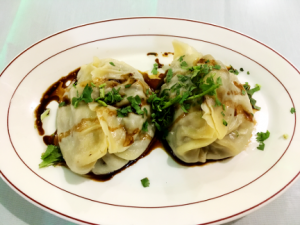 This Central Asian dish is quite similar to Tibetan momos. For those of us who have long regarded the claim that momos are Central Asian in origin as ridiculous (they are obviously just a kind Chinese baozi! ), Uzbek mantu are a thought-provoking dish. Like momos, they are filled with meat and onions—but instead of spices or broth, they are sprinkled with sweetened vinegar and herbs. They are very good. Next I ordered plov, or “Asian Pilaf.” This is an ancient dish, which seems to have changed little since the times of Alexander the Great. Plov is soft, slightly oily, very flavorful rice that has been cooked with cumin, coriander, onions, and other flavorings. It is then combined with cubes of meat. Salute also adds soft, boiled shreds of carrot. This is a very satisfying dish. The servings at Salute are large, however, and probably best shared with a group (plov is traditionally a dish for celebrations). I also had a chicken kabob. 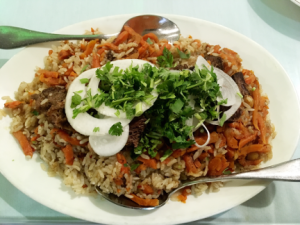 I rightly suspected that I would have little room for anything more after the plov, but I wanted to see how they handled this popular Central Asian fare. The meat was tender and infused with the smoke of an open fire—just right. There are currently many more Bukharian (or Bukharan) Jews living in Queens than there are in Uzbekistan, the birthplace of Bukharian culture. Many sources estimate that there are 50,000 Bukharian Jews in Queens, and less than 1000 in Uzbekistan (though the largest community, about 150,000, is in Israel). Bukharian Jews were oppressed for centuries in their native land, and emigration seems to have begun as soon as viable Jewish communities in Palestine offered an alternative, and picked up with the collapse of the Soviet Union. 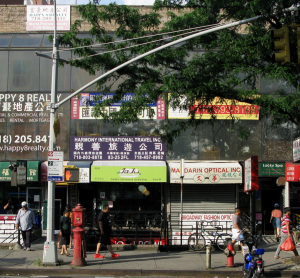 They are concentrated in Rego Park and Forest Hills, in an area dubbed ‘Queensistan’ by the New York Times. Two streets in Queensistan are especially known for their Bukharian restaurants: 108th (‘Bukharian Broadway’) and 63rd Road (sadly lacking an epithet). 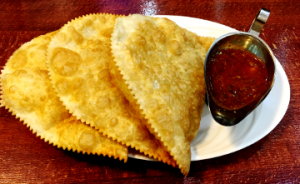 Cheburechnaya, sitting next to a grocery store and a few doors down from another Bukharian restaurant, is one of the most popular of these restaurants. From the street it looks like a large diner, but the sign mixes the Latin alphabet with Cyrillic and Hebrew. 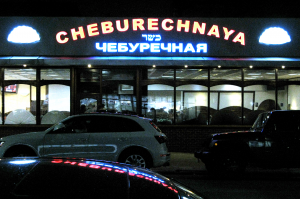 I first tried to visit Cheburechnaya on Friday night, but they were closed for Shabbat. So were all of the other Bukharian restaurants in the area. Cheburechnaya reopened at 7pm Saturday, and I did not delay, arriving shortly after sundown. Cheburechnaya has a brightly lit, cafeteria-like space; it is large, but on a Saturday night it is packed. The place is filled with lively conversation. I was hoping to hear a little of the Bukharian language, an old language derived from Persian, but I believe I mostly heard Russian and English. 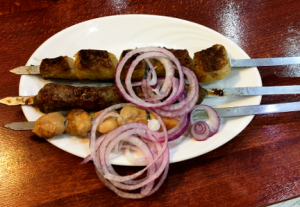 For my main course, I ordered kebabs—lulya kebab, lamb testicle kebab, and lamb fat kebab. 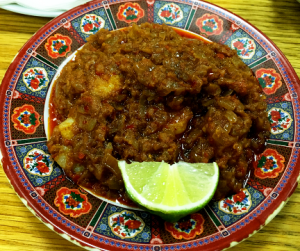 These are not specifically Bukharian; they are Uzbek dishes. 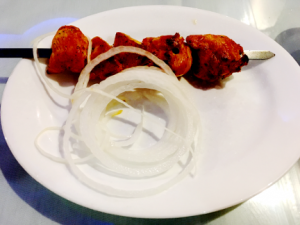 Possibly kebabs vary little from place to place anyway—the charred flavor of foods seared by open flame dominates the subtler flavors that distinguish many regional cuisines. These kebabs were distinctive though. The lamb fat kebab consisted of large cubes of pure fat cut from the meat of the lamb. It was infused with the charred flavor of kebab and some spice. The lamb testicles were actually not charred, but seemed to have been cooked at some distance from the flame. They were tender and surprisingly tasty. The lulya kebab was a bit like sausage, also very good. 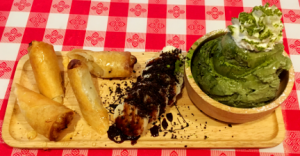 The high point of the meal, however, was the appetizer—chebureki with meat. Chebureki are large, flat, empanada-like pouches containing meat or some other filling. The pouch is made of dough lightly fried in oil. The meat inside is mixed with fresh herbs—thyme, rosemary, and perhaps some cumin and onion. These were delicious. Finally, I had to try an Uzbek dessert: chak chak. Chak chak is fried noodles covered in honey. The fried noodles are airy; they reminded me a little of marshmallow covered Rice Krispie treats. Not bad. They also have baklava; I think next time that is what I’ll be having. 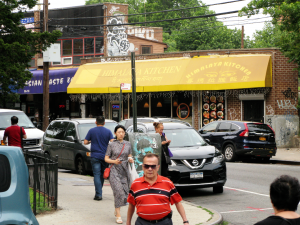 Many of the restaurants I’ve visited in Queens serve as community centers for specific ethnic enclaves. At Phayul, the wall outside the door is covered in flyers—many in Tibetan—advertising Tibetan religious events or social services for Tibetans. Often Tibetans going there for momos or other Tibetan dishes will run into friends there. At Awang, the cooks often stroll out of the kitchen and chat in Thai with friends who have come in for food from home. 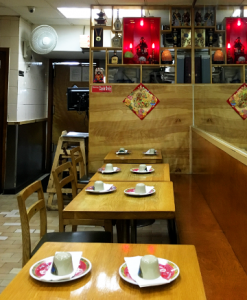 Some of these restaurants call their food Asian fusion or advertise their chow mein to broaden the appeal, but the majority of their customers are not interested in Asian fusion or chow mein. JoJu, a very popular and highly regarded restaurant in Elmhurst, is an exception. 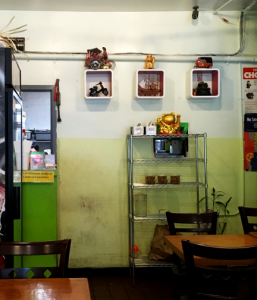 It describes its food as “Modern Vietnamese.” But the owners are from Taiwan, and the workers are required to know Mandarin—the most widely spoken language in the neighborhood—not Vietnamese. The menu itself is true Asian fusion, featuring elements from Japan, Korea, and Vietnam. 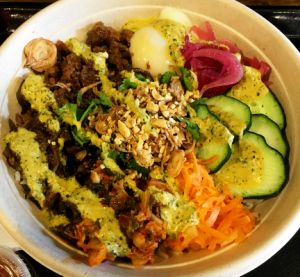 JoJu started off as a Vietnamese sandwich (banh mi) shop, and has since expanded to include a rice bowl shop downstairs. I went to the new extension. It is one of several cellar shops with entrances below the street. You must go down a stairway; at the bottom you will find a furniture store, a manicurist, and a few other shops, as well as JoJu Bowl. 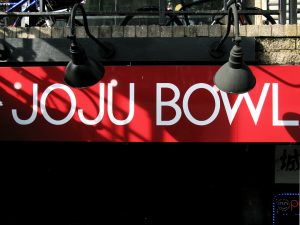 Despite being below the street, JoJu Bowl gets a lot of light through its front windows, and the dining area is pleasantly sunny. The décor is also bright and cheerful: one wall is covered in friendly messages painted to look as though they were handwritten, featuring exclamation points and doodles—everything short of emoji. “Step 1: Pick a protein” (I picked Korean-style thin cut marinated ribeye). “Step 2: Pick a base” (I picked Jasmine rice). “Step 3: Add spicy!” (I picked green sauce). “Step 4: Special Toppings!” (I picked Onsen Tamago, Japanese poached egg with runny yolk). “Step 5: Homemade Drinks” (Frankly the offerings were not exciting, so I had water). The result nicely combined high, sour notes from pickled daikon, red onion, and carrots and from kimchi, and low notes from marinated beef and peanuts. The spicy green sauce was not very spicy; probably milder food has a wider appeal among JoJu’s mixed clientele. But if you want your JoJu bowl to have a specifically Vietnamese flavor, you can ask for fish sauce (nước mắm) on the side. Like shrimp paste, this is made from pulverized and fermented dead things. Just a small amount of fish sauce will make your JoJu bowl smell and taste suspiciously funky. However, as shocking as fish sauce may be the first time you try it, it is possible to enjoy this condiment, if only because it transforms the dish so completely. The long curve of the Himalayas reaches into northern Thailand, where it tapers into the Thai highlands, an area whose hills and valleys have long sheltered diverse ethnic groups from the outside world. The area is home to immigrants from Myanmar, China, and Laos, and to many ancient tribes. The kingdom of Lanna ruled here for centuries, and today roughly six million people in the region speak the Lanna language. People also talk about a Lanna cuisine. 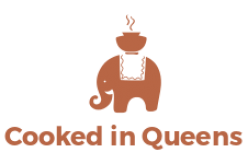 It probably draws on traditions of the many tribes and ethnicities of the highlands, but it boasts dishes known not just across northern Thailand, but around the world. One of the more famous of these is kaeng pa, or “jungle curry” as it is usually called in the West. Thai cooking in general relies heavily on pastes made from spices and herbs; Lanna cooking relies especially on pastes made with lots of chilies—remarkable amounts of chilies. 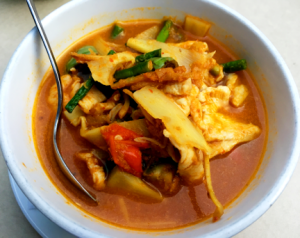 Kaeng pa combines such a paste with water, meat, and vegetables—as well as fresh chilies. The result is amazing. The dominant flavor is a refreshingly sweet herbal flavor paradoxically joining forces with a nearly overpowering spiciness. I had kaeng pa at ShriPraPhai tonight, and however enjoyable it might have been, it required some endurance of me. The spice made me sweat; it made me cry; I went through several tissues blowing my nose. When the spice had engulfed my senses and more or less blocked out other thoughts, I decided I had got my money’s worth. But really, it is a bit hard on the stomach. It was almost as difficult as eating a plate of fried long chilies at Ema Datsi. ShriPraPhai is an old restaurant, dating back to the 1990s. 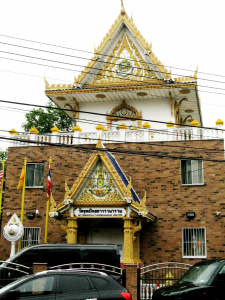 It may be the oldest Thai restaurant in Woodside or Jackson Heights. 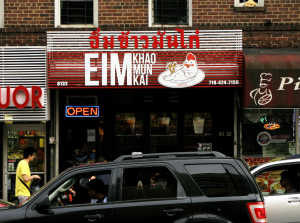 In any case, it is an institution—for many people, the Thai restaurant in New York. And it has grown to fill the part. The restaurant has several dining rooms with dozens of tables, including a large back-yard patio. More importantly, it has a book-sized menu with an admirable selection of dishes (although you will still need to visit some of the areas other Thai restaurants to try some Thai dishes, such as blood soup). For an appetizer, I had chicken-shrimp dumplings. These had a delicate wrapping, and were sprinkled in crushed peanuts—a southern dish, no doubt. The shrimp inside provided most of the flavor, along with a vinegar-soy sauce mixture on the side. These are difficult not to devour. 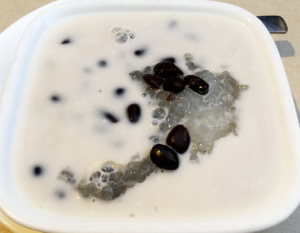 Finally, I had tapioca and black beans in sweet coconut milk for dessert. I doubt this can be pinpointed to any region, closely resembling desserts from other parts of Southeast Asia. In any case, it is good—ever so good. Sometime in the 8th century, a new spice began appearing in markets around Europe, an aromatic root related to ginger. Valued both for its flavor and aroma and for its medicinal properties, it had been brought to Europe by Arab traders. It came to be known in Middle English as galingale, from the Arabic kalanjan. This in turn may have been a corruption of the Chinese gāoliánjīn (ginger from Guandong). Galingale must have been popular; it has been found on the shopping lists of monks for their trips to Cambrai. Galangal, as it is known today, is probably native to Java, and is used most heavily in Indonesia and Thailand. Thailand has undergone several waves of immigration since monks first bought galangal in Cambrais, so it is likely that the uses of galangal there have varied over that time. It is used heavily in Thai cooking today, and it’s the ingredient that gives Thai curry its special aroma and taste—sweet and floral. The galangal adds a wonderful note to the kang som sour curry at Ayada in Elmhurst. But the galangal is not as dominant in this dish though as it is in much of the Thai food that you can buy in the United States. Most Thai food in the US is relatively mild, which has the effect of showcasing the delicate spices like galangal. But Ayada’s kang som sour curry is fiery hot and bracingly sour, a storm of flavors that bewilders the tongue. Kang som sour curry is a soup. The major solid component is a broccoli omelet that has been cut into cubes and dunked in the broth. The soup also contains jumbo shrimp. It has a complex bouquet, consisting partly of galangal’s perfume and the Thai sweet and sour sauce, but also of something else—something funky. 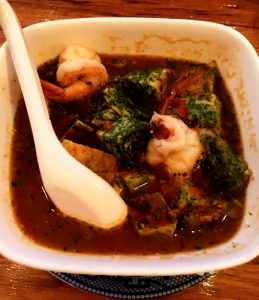 I began to suspect that lurking somewhere in this soup was some unadvertised shrimp paste. 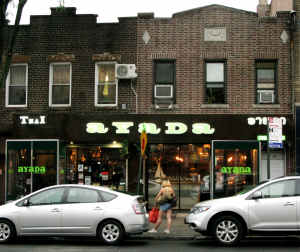 Ayada is popular, and many of the diners when I went were young people having drinks and having animated conversations. The walls are decorated with old photographs, possibly of the Thai royal family, but they are treated as elements of the interior design, not attempts to recreate Thai culture. The TV by the door was tuned to America’s Top Chef. To complement the food, I ordered a lychee sangria. This is quite a good summer drink. The smudged lime-green walls at Sky Cafe suggest a tropical languor, as if you had just stepped into a village where all the restaurants are family-owned and and decorated to evoke the cheerful palm fronds and bamboo groves outdoors. 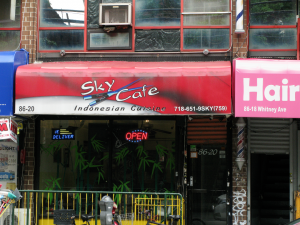 Sky Cafe is in fact a family run business, but there is nothing languorous about it (unless it is the rather thick syllables of Indonesian conversation going on at every table; Indonesian syllables, like those of Tagalog, strike me as resembling the sounds of big bubbles bursting). There are usually two people on hand (children and other relatives of the owner), and when business picks up, they keep food coming to tables with remarkable efficiency. Tonight I ordered nasi putih uduk empal. This, the waitress said, was rice and beef wrapped in a banana leaf. It was brought to me neatly wrapped in paper tied with a rubber band. 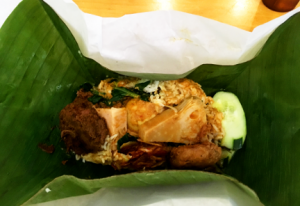 Inside the banana leaf were hunks of spicy redang beef, spicy hard-boiled egg, wedges of braised jackfruit, fried patties of mashed potatoes, cucumbers, boiled rice, and anchovies, all folded in a large banana leaf. The redang beef pulled apart along the muscle fibers, like boiled beef in a stew, and was slightly tough—very like the redang beef at Upi Jaya, but a bit softer. (I have seen reviews on Yelp criticizing Upi Jaya for its tough redang, but I believe this is considered desirable in Sumatra.) This is a wonderful dish, bringing together subtle and potent spices, as well as hints of sweetness. This was my second trip to Sky Cafe; I went earlier this week, and ordered longtong sayur. 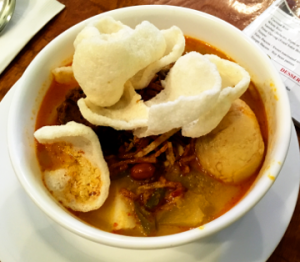 The basic elements of lontong sayur, which is generally considered a breakfast dish, are Indonesian rice cakes (lontong), tofu or tempeh, and a hard-boiled egg in a soup of curried coconut milk with sambal (a seasoning made with chilies and shrimp paste). At Sky Cafe, lontong sayur is prepared with a juicy hunk of beef rendong and assorted nuts and vegetables. It is topped with what I believe are krupuk kemplang—fish crackers. The lontong are soft and delicious. Traditionally they are made by boiling pre-cooked rice in a permeable container, often a banana leaf that has been rolled around the rice. The boiled rice forms a soft mass. To me, it is indistinguishable from the nasi impit (Malaysian rice cake) that Taste Good puts in rojak, though supposedly nasi impit is supposed to be compressed in some way. The lontong cylinder is cut into discs, and these are then quartered, yielding bite-size wedges. Lontong are a very satisfying base for a meal, but the real excitement is in the spices. 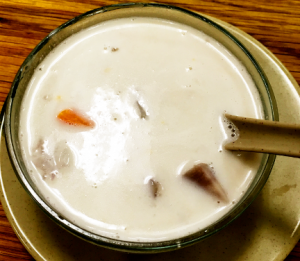 Just a sip of the coconut milk bursts with flavor from a wide range of spices, slightly hot and exceedingly savory. The beef redang is soft and burns with its own low fire of Arabic spices. The nuts and the egg mix wonderfully with these flavors. Both nights I followed dinner with a shaved ice drink. The first night I had es teler. This is similar to Filipino halo-halo. It consists of sweetened coconut milk with shaved ice, with avocado and jackfruit, along with other fruits and beans and tapioca pearls. Tonight I had es sekoteng medan. 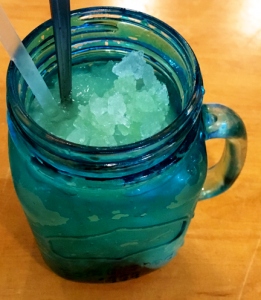 This is also a shaved ice drink, but it is a little sour, like a weaker version of lemonade. 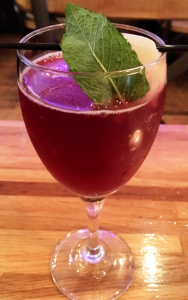 The sourness appears to come from boiled, fermented orange peels that sit, blood red, at the bottom of the drink. It also has green jello, lychees, and supposedly barley, although I could not find any barley in mine. This is a good drink for a hot day, although perhaps it is a mistake to call it a dessert. Dek Sen is known for its desserts, and I went there with an ice cream dish in mind. But before ice cream came a blood dish. Nám tòk in Central Thailand is soup prepared with raw blood from pigs or cows. It usually contains a variety of solid foods: noodles, dumplings, meat, and vegetables. I ordered nán tòk neûa. This is a spicy soup with, of course, blood broth, but also dumplings, bean sprouts, boiled beef, chilies, and noodles of your choice (I had flat, pulled noodles). It has some of the savory spiciness of many Indonesian dishes. The dumplings take up the flavor especially nicely; they are delicious. 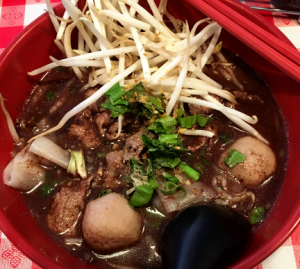 The broth is spicy and savory, but it is also a bit a little pungent. After bringing me fully six different condiments to complement my soup (including various kinds of chilies and, of course, shrimp paste—Thailand being as enamored of the stuff as the Philippines and Indonesia are), my waitress patiently helped me approach a correct pronunciation of nán tòk neûa (a song of a name). Thai has a complicated tonal pattern, and the name of this soup sounds like a question, answer, and exclamation. About half of the customers at Dek Sen spoke Thai, with each other and with the staff, so I had ample opportunity to listen. It does not belong to the Sino-Tibetan language family, or to the Austronesian language family—Thai belongs to the Tai-Kadai language family which, at roughly 85 million speakers of all the languages combined, is much less prevalent than the Sino-Tibetan and Austronesian groups. For dessert, I ordered fried banana ice cream. This was really fried bananas and ice cream, but I won’t complain. The fried bananas were very tasty—wrapped in some kind of crepe with honey drizzled over them. There were also fresh bananas with chocolate, and (I think) Thai tea ice cream. Very good. I tried another phrase on the patient waitress before leaving: kòb kun, which I hoped meant thank you. Excellent food and a little language instruction besides. Parks dot the stretch of Broadway from Elmhurst Hospital to the Elmhurst subway station. Here in the mornings you will often see elderly Chinese performing slow Tai Qi movements or aerobics to the accompaniment of a portable radio tuned to Chinese pop music. 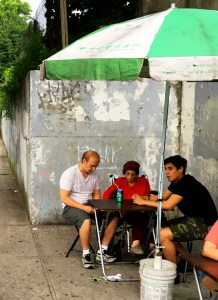 On weekends, people from all over the neighborhood go to these parks; children play hopscotch on the sidewalk while old men play Chinese chess on concrete steps and a group of men plays handball in the court behind them. Across the street from these recreations are rows of storefronts under dingy awnings. 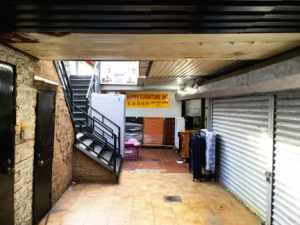 My destination lay between two Chinese grocers, a Malaysian restaurant—Taste Good—with a storefront so small you might not even notice it. 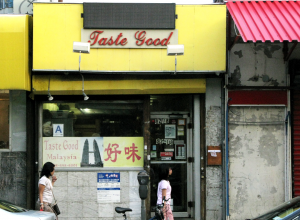 The interior of Taste Good is long and narrow. A colorful statue of Guan Yu looks over the room from a shelf, which appears as though it might be a serious shrine. The walls are largely covered with pictures of different dishes. I felt as though I had stepped into one of the luncheonettes in Chinatown. And indeed, I noticed right away that I was surrounded by a language that sounded Chinese, though it did not seem to be standard Mandarin. Probably, it was Hokkien—a language from Fujian, where many of the Chinese migrants to Malaysia came from—or Cantonese. This was a highly successful dish. 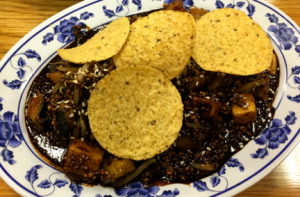 It is true that the shrimp paste surrounded it with a slight odor of rotting garbage, as if there were an open dumpster just out of sight, but the brain—my brain, at least—finds it hard to connect decay to something that tastes as fresh as this rojak, so the smell seemed safely peripheral. The flavor of the shrimp paste can be detected, but it complements the sweetness of the other ingredients nicely with its pungent earthiness. I also had nasi sambal udang. This is a bowl of jumbo shrimp drowned in a sauce consisting of what the menu called “exotic spices.” I cannot say what most of them are, but the most prominent is chili peppers. It also has, perhaps more prominently than any of the spices, a lot of shrimp paste. If you push the main pulp of the sauce to one side, the thick red fluid that shrimp paste is suspended in runs out on the plate. You will probably want to brush your teeth after eating this food. I believe this is originally a Sundanese dish, from the western part of Java, but I will have to confirm. Finally, I had bubur cha cha, a Malaysian dessert. This is a mix of cooked sweet fruits in vegetables in coconut milk, a little similar to the mung bean porridge bubur kacang hijau (the Indonesian dessert I had at Asian Taste 86). 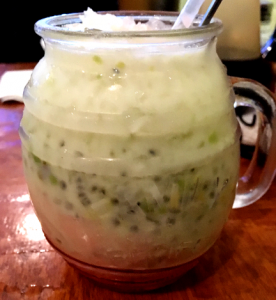 But instead of mung beans bubur cha cha has sago or tapioca pearls, along with black peas, chunks of yam, and other sweet vegetables. Quite nice. Like Awang Kitchen, this Indonesian restaurant advertises an Asian fusion menu. And you can order some Japanese dishes at Asian Taste 86. But when I went, all of the customers were Indonesian, and I doubt anyone ordered Japanese food. In most other ways, it is unlike Awang Kitchen. 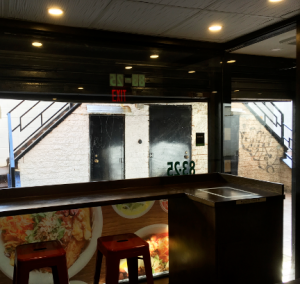 The front door constantly threatens to bang into the person sitting at the table by the door. The dining area would be small for a living room, and the tables awkwardly protrude into every place you might want to walk. But, like someone’s living room, it is quirky, and has its own charm. 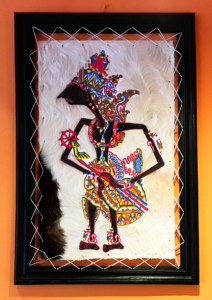 The door to the kitchen is covered with a shower curtain, and wayang-themed artwork on animal pelts that are either amazing or tacky—I couldn’t decide—adorn the walls. When I was there, a large TV over the counter was tuned to mixed martial arts, and I watched a fighter work a cut over his opponent’s eye open wider and wider in a very bloody match. Some of the foods I’ve eaten recently have landed some solid punches too, and while I am learning to appreciate shrimp paste, it is an arduous curriculum, and my experience of balut has made me suspicious of almost any food. All of which is to say that while I very much wanted to try Asian Taste 86’s nasi goreng jawa (stir fried rice with shrimp paste and egg), an instinct for self-preservation prevented me from ordering anything with shrimp paste tonight. Instead I ordered goat satay. I had thought this could come smothered in peanut sauce, but satay can come with other spicy sauces as well. 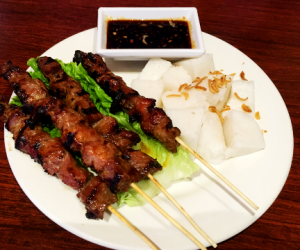 The goat satay is marinated in some other spicy sauce, and comes with “sweet pepper soy sauce”—a thick, sweet soy sauce with very hot peppers in it. 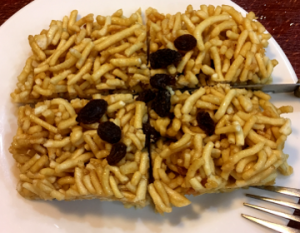 Along with skewered cubes of goat, the dish comes with rice cakes, which are a perfect companion. The high point of the meal was dessert. I ordered bubur kacang hijau, a mung bean porridge. I found bubur kacang hijau on the dessert menu, but it can be eaten for breakfast as well, and breakfast seemed to be the meal Asian Taste 86’s cooks had in mind when they prepared it: I could barely detect any sweetness at all, and what sweetness there was may have come from the coconut milk they had poured over the mung beans. 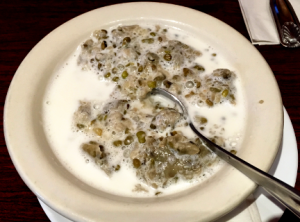 In coconut milk, the mung beans had a texture almost like mashed peas. Like breakfast cereal, bubur kacang hijau was a comforting dish. 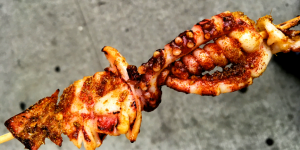 I discovered a Chinese barbecue stand at the corner a few blocks from Asian Taste 86, so I stopped there for barbecued squid. It was just like the barbecue stands you can find in open-air markets in China. The squid (or chicken or whatever) is coated in cumin and other spices, and if you ask for spicy, healthy doses of chilies. There is no subtly to the seasoning; it is spicy, smoky, and good for a snack. I’ve noticed a few of these stands around Queens lately—so perhaps the open-air markets are taking shape here as well.